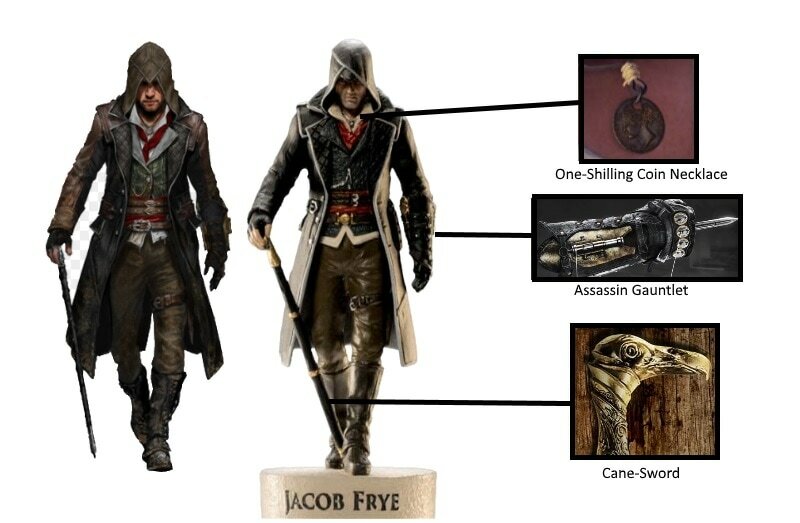 The Jacob Frye Figurine replicates the Outdoorsman Outfit, as seen in Assassin's Creed Syndicate. Eqipped with his Adept Cane-Sword and Black Leather Gauntlet, the figurine accurately replicates Jacob with his most recognisable gear. Jacob's Adept Cane-Sword features a golden vulture handle, giving him the appearance of a gentleman. The Cane-Sword also made an appearence in the Assassin's Creed Movie, where Abstergo Industries housed it in the Madrid Facility. ​I was pleased to see that the Jacob Figurine features his shilling necklace, which he keeps on his person as a memento. You can also see the Silver Pocket Watch, tucked into Jacob's waist coat. I really like the details that can be seen on the Assassin Gauntlet and Rope Launcher. The colouring is excellent, and the tiny details, such as silver brass knuckles make his left arm look extremely accurate. One detail that I noticed is that the Jacob figurine features the diamond pattern on the back of the coat, another accurate feature. When looking at the back of his coat, you can also see a black pouch that is used to store items. If you look extremely closely at Jacob's right arm (holding cane-sword), you can slso see the four buttons on the jacket sleeve that the Outdoorsman Jacket has in the game. This small detail shows that a lot of time and effort has gone into making the Jacob figurine. We start issue #4 with a breakdown of the Jacob Frye Figure, and background on his character. His motives and tactics are mentioned in this section, and his accomplishments as a brawler. One thing that I learned from page one is that Jacob wears a shilling necklace as a reminder of his first pick-pocketing attempt. The next section is a character profile, focussing on Jacob's motives and goals. Born and Trained by Assassins in Crawley, the Frye Twins moved to London to liberate it from Templar leadership. Jacob's gang, The Rooks were created to remove corruption from the streets of London. This served Jacob and Evie as a way to gain information on targets. Concept Art for Henry Green can be seen in the bottom right hand corner. ​The next section is titled Weaponary and Equipment, and looks at a number of items used by Jacob in the game. "The 19th Century Assassin's Arsenal" contains Brass knuckles, Sword Canes, Fire Arms and many other deadly tools. In the bottom left hand corner we see an Assassin engraved brass knuckle. ​"Friends and Allies" focusses on the different factions that can be found in the game. The Rooks, Blighters, Police and Templars are all listed here, with details on their London activities. On the right hand side we have historical figures who make an appearance in the game. Charles Dickins, Alexander Graham Bell, Charles Darwin, Florence Nightingale and Karl Marx all serve a purpose in the game. The next section is Environments, and examines the different boroughs of London. Westminster, The Strand. Southwark, Lambeth, Whitechapel and The City of London all feel extremely different in the game, and this section explains what happens in each borough. For example. Lambeth feels extremely industrial in comparison to The Strand. Turning over we have an environment that served the Assassins well throughout their time in London. "The Great Eagle" was the train hideout used by Jacob, Evie and Henry, and is a base of operations for the Assassins. The Train (and Rope Launchers) were stolen from a Templar gang leader called Rexford Kaylock, who was killed by the Frye twins. The last environment we see is The River Thames, an iconic landmark, impossible to miss on a trip to London. The River was home to many of Jacob and Evie's adventures, and was frequently used by Assassin enemies to transport cargo. 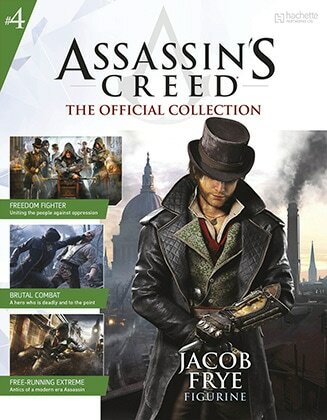 Although I enjoyed the magazine on Jacob, I feel that George Westhouse should have been in the Friends and Allies section, as he was the Assassin who sent Jacob and Evie to kill Templar targets at the beginning of the game. George is often forgotten as he only appeared at the beginning of Syndicate, but is an important character all the same.